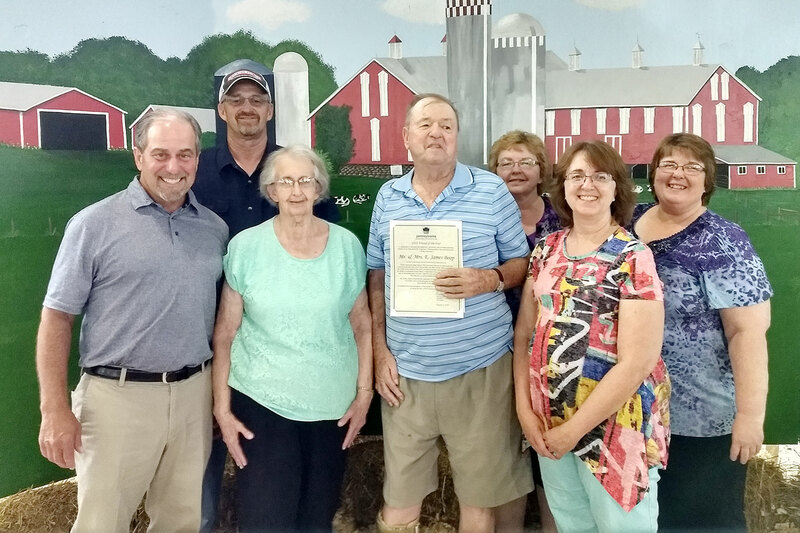 The PA Department of Agriculture Friend of the Fair Program recognizes and acknowledges the hard work and dedication put forth by fair volunteers. Recipients are individuals (or groups) who have demonstrated outstanding leadership, volunteerism and dedication, resulting in a significant contribution to the success of the local fair. 2018 Friend of The Fair Jim and Floss Boop with their family. August 2018 — Jim had been a fair member for so long that no one can really remember when he started. Jim makes his way around the fair helping wherever he is needed including the construction of the stage roof and our beautiful show arena. He works with the Lions Club Bingo and enjoys “ruffling the ladies feathers” with his wonderful sense of humor. Jim is dedicated to helping future agriculturists by attending the Livestock Sale and purchasing animals. His purchases have helped many children build their future in farming or with college expenses. In the 1980’s, Florence (Floss) would help with the manual entry of exhibits and typing the exhibit tags and judges’ sheets. When the fair began using computers, Floss would help in the office, handing out tickets and answering phones. She always greets you with a lovely smile and kind words. In addition to her office duties, Floss helped bake pies and cakes in the Lutheran Church Stand took orders and served food during the week of the fair. If her children couldn’t find her there, she was probably in the Mifflinburg Band Boosters stand when her 3 daughters were active in the band.